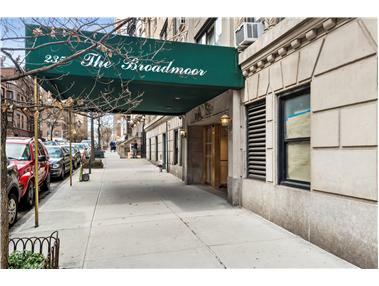 At last, a two bedroom/ two bath apartment has become available at the Broadmoor. Oak strip floors, beamed ceilings, and pre-war detail throughout are some of 7N's many wonderful features. Light pours into all the rooms, the corner master bedroom has a double exposure facing south and west and also a windowed bath. The spacious living room is approximately 22'5' x 11'9' with ample space for a dining area. Both bathrooms have the original subway tiles and are in good shape. The building is a gem in the midst of the most exciting area on the Upper West Side. It is steps away from the world of gourmet eating where one never has to cook again. Appropriately, the entrance into the building is through a charming lobby that has the marble floors and plaster detailed ceiling. It is a fitting entrance into the world of the Broadmoor. The Broadmoor is an 18 story prewar building with a 24 hour concierge and doormen. The live-in superintendent has a staff of porters and maintenance people. There are bike rooms on each floor and a well-kept laundry room in the basement. There is a large, one of a kind glass enclosed solarium and an outdoor deck at the top of the building which the Broadmoor community uses as a place to view gorgeous sunsets, get some sun, and use wireless internet access.